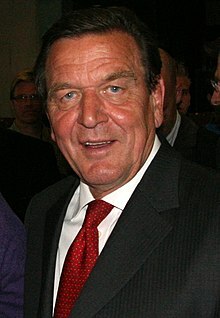 Gerhard Fritz Kurt Schröder ([ˈɡɛɐ̯haɐ̯t fʁɪts kʊʁt ˈʃʁøːdɐ] ( listen); born 7 Aprile 1944) is a German politeecian, an wis Chancellor o Germany frae 1998 tae 2005. As a member o the Social Democratic Pairty o Germany (SPD), he led a coalition govrenment o the SPD an the Greens. Afore acomin a full-time politeecian, he wis a lawyer, an afore acomin Chancellor he served as Prime Meenister o Lawer Saxony (1990–1998). Follaein the 2005 federal election, which his pairty lost, efter three weeks o negotiations he stuid doun as Chancellor in favour o Angela Merkel o the rival Christian Democratic Union. He is currently the chairman o the buird o Nord Stream AG, efter havin been hired as a global manager bi investment bank Rothschild. This page wis last eeditit on 10 Mey 2018, at 01:36.